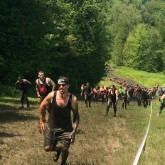 In Canada the first few Spartan Races of the season took place in May at Mont Tremblant Ski Resort. As you are training for the remaining races (perhaps, I will see you at the Toronto Sprint? 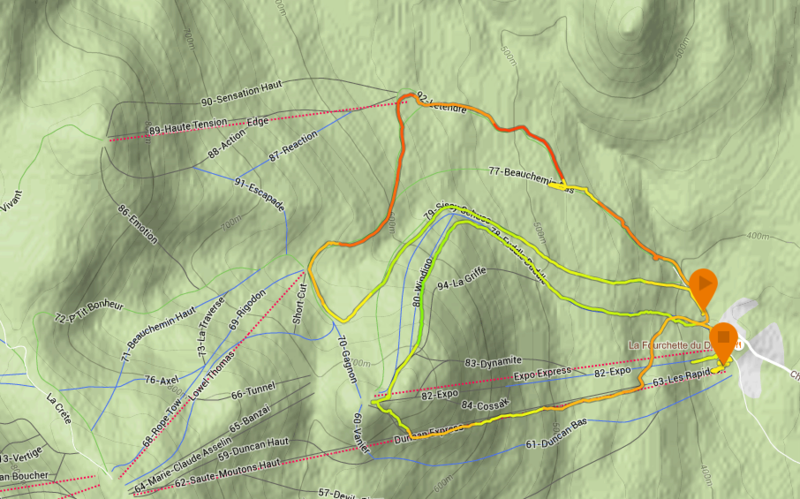 ), here’s a look at the course distance, elevation and map [compliments of Jen Milligan]. The Grip Traverse. One of my new favourite obstacles is the wooden gripper, basically a strip of wood with wooden block holds on each side that you have to make your way across. They strategically placed this right before the longer then usual monkey bars. Sled/Tractor Pull. A sled with a sandbag in it that you have to pull a certain distance, heavier then I was expecting but the route was fairly short. Balance Beam to Slack Line. 14-16 foot wooden balance beam to a slack line then hit the bell, fun obstacle. Zig Zag Traverse Wall. They have already brought this one out in the U.S. races and now we have it in Canada. Instead of traversing in a straight line you have to zig zag around corners. Slip Wall. Similar to last year except safer in my opinion. Last year it was slip wall with plastic and sometimes they decided to put soap on it, you got to the top with a slippery rope and you had to get down on a slippery rope. This year it is metal (I actually thought it would be very slippery and hot in the sun). It is actually easier then I was expecting, metal slip wall up the rope and then metal ladder down (a lot safer). Tire Carry and Tire Flip. I haven’t seen in Canada races. The ladies tire flip was very light. Platinum Rig. It’s back again and for the 3 races I have raced in Canada already it has changed each race. Even the two day sprint it was different both days. Want some strategies on how to get across the rig? 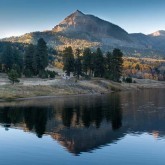 Check out this blog post, and the videos of getting across two rigs. Walls. You know the drill. Over, under, through walls, 7 & 8 foot walls and inverted wall. Spear Throw. They added the rope to the spear this year. Barbwire & Cameo Crawl. Barbwire was very high and the cameo crawl was on a slight uphill. 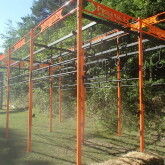 Rope Climb, Hoist, Dip Walk, 2 A-frame Cargo Nets, Jerry Cans (in Spartan Super) and Fire Jump. Hills. A huge obstacle for some, there were two big hills (3 in the Spartan Super, and the last one, crazy steep). [Check out this blog post on how to get faster running downhill.] The terrain going downhill ensured that you couldn’t really get a solid footing. There were a few spots, however, where you were able to get some good running in before you hit an obstacle or bad terrain. Liked this post? Check out the analysis of distance, elevation and difficulty for the 2014 Spartan Race World Championship in Vermont.